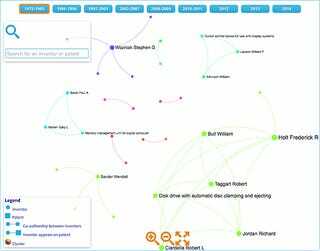 Like a game of Six Degrees of Kevin Bacon, these interactive maps show the relationship between all the inventors listed in Apple's patents and its Wizard of Oz: Steve Jobs—the big red dot. He's connected to almost every patent and team, from industrial design to hardware to user interfaces to music to security. 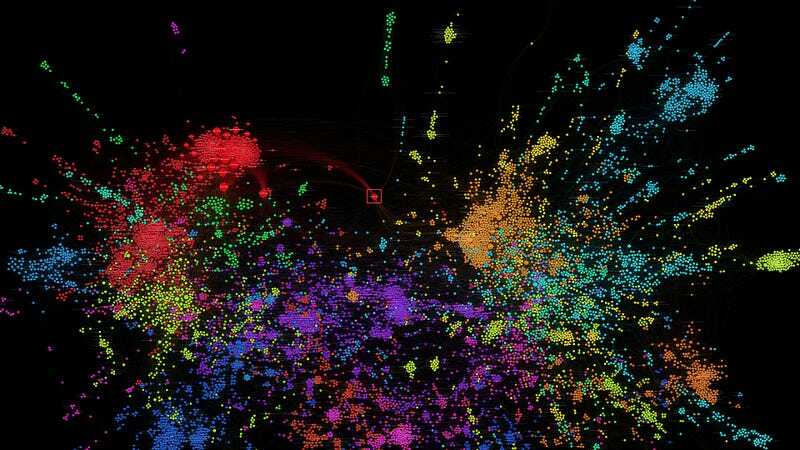 The visualisation above shows that Apple's full technology portfolio is composed of clearly identifiable clusters of inventors and related technologies. The top part of the bright red cluster at the left consists of Apple's industrial design team, led by Jony Ive–the bottom part is mainly composed of patents and inventors relating to mobile device components. Steve Jobs served as the key connector between the left and right parts of the network, by connecting the bright orange at the right (which consists of all things related to user interfaces and operating systems) to the design and mobile devices cluster. The cyan cluster at the right is largely focused on iTunes, while the small bright green cluster on the far right is composed of Apple's experts and patents in data encryption and security. Although interesting conclusions can be drawn from 'static' networks based on fixed time periods such as the above, dynamic network analysis spanning multiple time periods can provide a whole new perspective on the actual formation and decline of (sub-)networks. Let's start dissecting the above network based on various time periods to get a sneak peek into Apple's technology history. Make sure to go to Kinedict to fly through the clouds.